What started out as a single tree has become a mighty forest at the Island Lake Conservation Area. 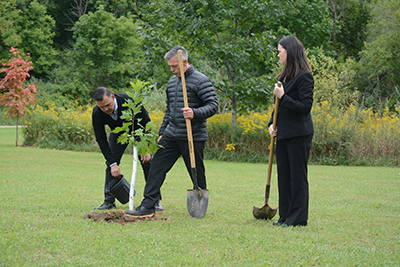 The forest area, located on the south side of the park, began 16 years ago when Dods & McNair Funeral Home, Chapel, and Reception Centre started planting trees in memory of those who had passed through the funeral home. Every year Dods & McNair hosts an annual dedication service at the conservation area and invites people who lost a love one to attend. A tree is planted and dedicated to those who have departed. The funeral home works with the Credit Valley Conservation who provide the trees and maintain the park and trails. The forest has a mix of hardwood and softwood trees and a trail that runs through the area. The dedication service is held in an open area next to the forest a allows people who have lost a loved one to come together and see another tree planted as a living memorial to those that have departed. The service was largely attended with 710 arriving cars being counted as they parked in several areas adjacent to the area. Over1200 people were in attendance. The dedication ceremony featured a solo performer, and several guest speakers who read from scripture and offered words of encouragement. During the dedication ceremony, a passage was read that allowed visitors to say the name, aloud, that they were there to remember. At the ending of the dedication ceremony, butterflies were released as a symbol of a new beginning and a metaphor for the new seasons or journeys that are experienced in life.